Thank you for joining me as we count down to the next MFT release. We are six days away from the big day! All the new Stamps, Die-namics, and Stencils will be available on Tuesday, July 8th at 10:00pm EST. Be sure to check out the MFT Blog to see all the new items being revealed today. Don't forget to leave a comment on the MFT Blog Countdown posts, YOU could win one of the seven $75.00 gift vouchers. I have a couple of yummy projects to share with you today. 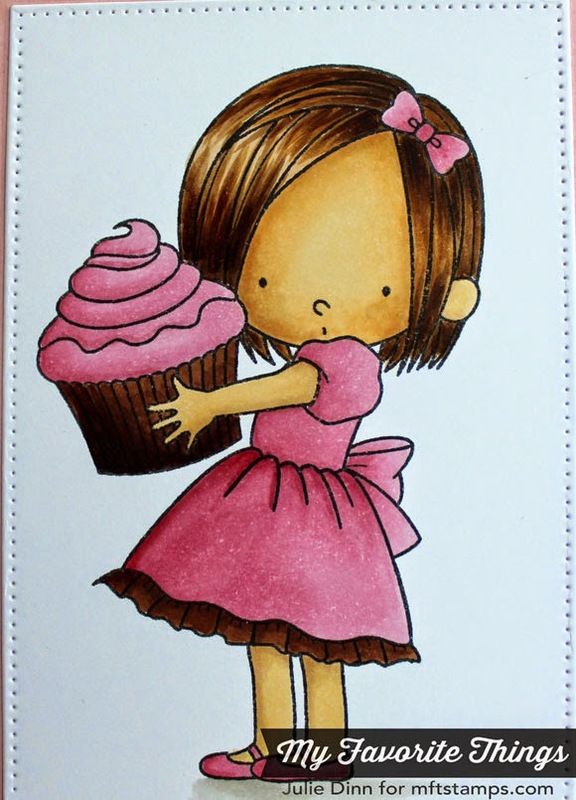 First up I have a sweet card featuring the new Birdie Brown stamps set, Sweet Birthday Wishes. Isn't she adorable? I stamped the image on a piece of X-Press It card stock with Black Licorice Hybrid Ink, and I die-cut the image with a Pierced Rectangle die. I then coloured the image with Copics. 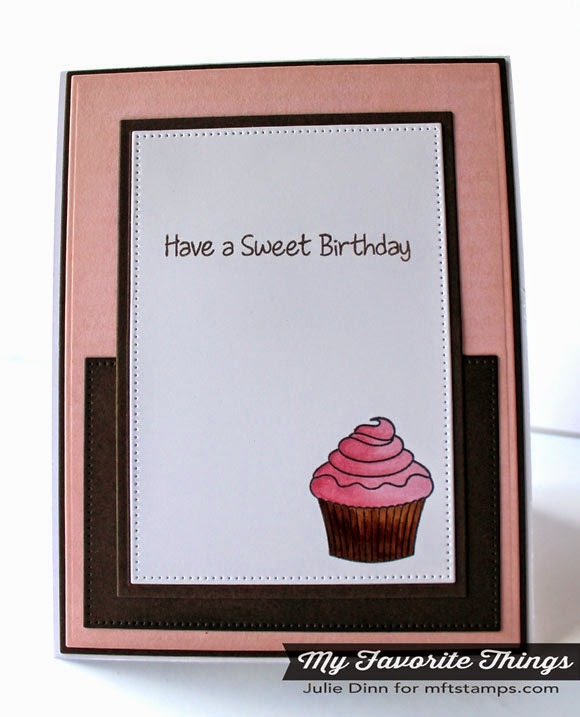 The background of the card was stamped with the new Happy Birthday Background stamp. On the inside of the card, I added a sweet cupcake and a sentiment from the Sweet Birthday Wishes stamp set. 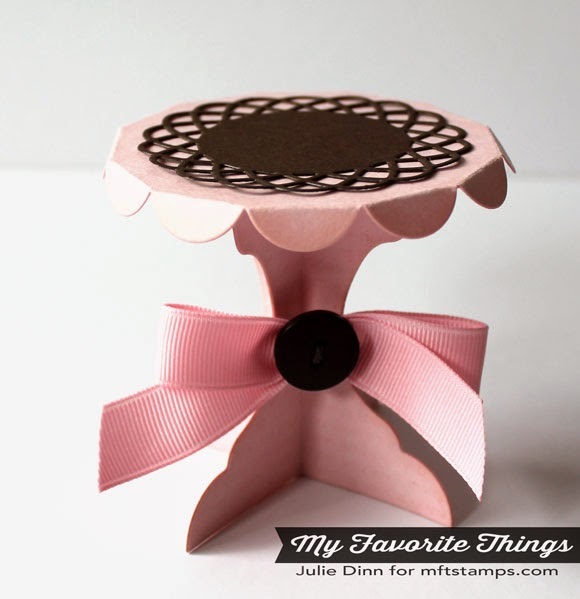 I created this sweet cupcake stand with the new Cupcake Stand Die-namics die. I started out by stamping a few pieces of Pink Lemonade card stock with the Happy Birthday Background stamp and Bubblegum Hybrid Ink. I then die-cut the cupcake stand pieces and assembled them with sticky tape. I added a small Dizzy Doily to the top of the stand. A big pink bow and button were the final touch. Thanks so much for joining me today. Be sure to check out the MFT Blog to see all the yummy designs the MFT Design Team has to share with you. SO CUTE! Love the pink and brown! Another of my favorite color combos... Thanks Julie! Gorgeous color combo! She is just darling! She is a cutie!! This is all wonderful!! Adorably pink combo set for any little or BIG girl. Wonderful cupcake stand and artwork not to mention the actual cupcake itself. Stunning presentation. Such pretty colors!! Totally adorable projects!! your set, is so pretty! Love the pink and brown. Adorable card. Such a cute card! Pink and chocolate are my favorite! that cupcake stand is too dang cute! 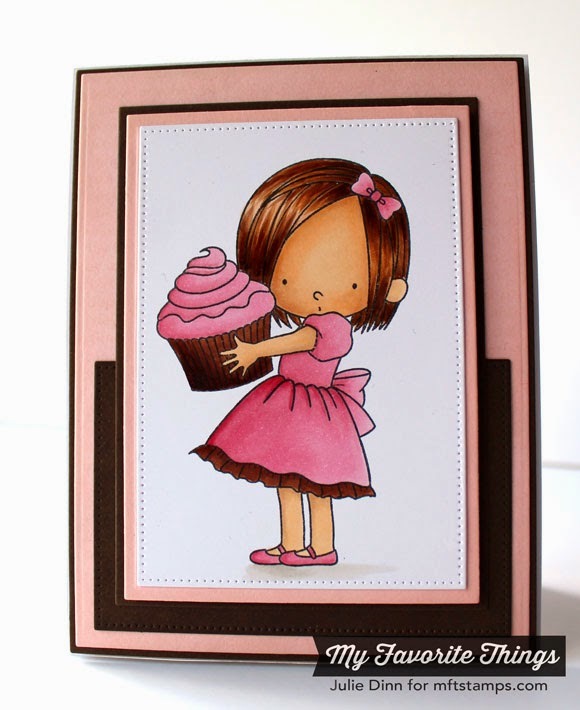 Adorable card -- and that cupcake stand is super cute!! Totally adorable cake stand ! SHUT UP!!! How cute is she, and I love the brown and pink! pink & brown are always a winning combination - such a fan! 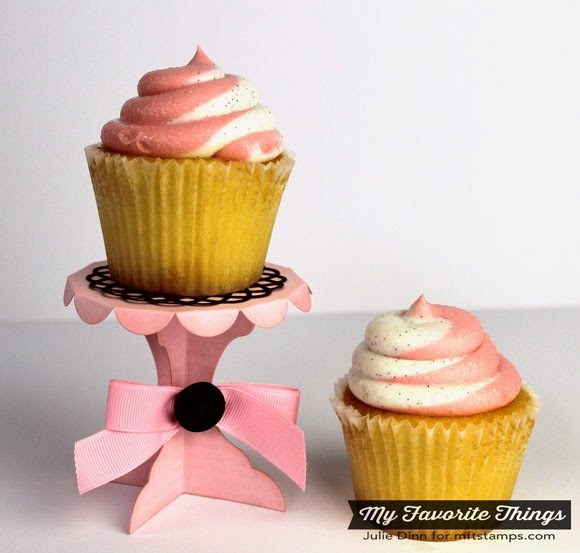 And the way you dressed up the cupcake stand with the bow is super creative! This is Ahhh-Dorable! Love your coloring. I LOVE-LOVE-LOVE this! Great coloring and color choice.